Talk about a retro recipe–fudge made with peanut butter, sugar, marshmallow cream, milk, vanilla. 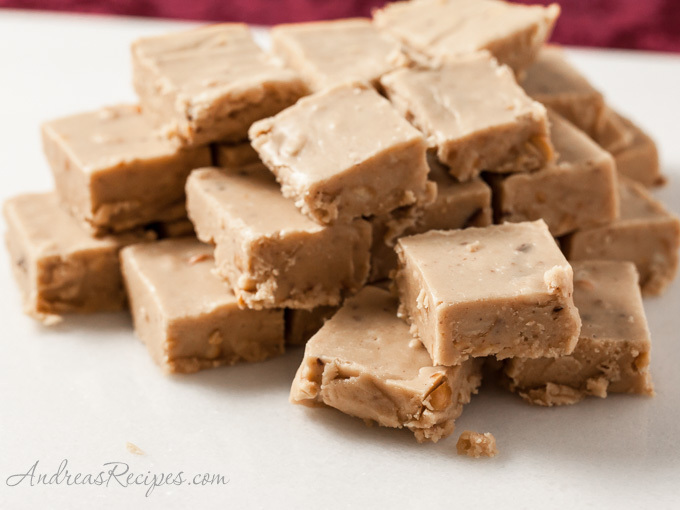 My mother has been making peanut butter fudge for as long as I can remember, and it’s my dad’s favorite Christmas treat. I’m pretty sure Mom got the recipe on a jar of peanut butter back in the day. I remember when Michael first tried it and he told me that I would have to make it every year. My boys always look forward to it, and even with all the nibblers, we try to make it last as long as possible. This is one of those Christmas recipes you can make early and store in the refrigerator, as it will keep for several weeks in a tightly sealed container. Combine the sugar, butter, and milk in the 4-quart pan. Boil until the thermometer reaches 234° F/112° C, also called soft ball stage in candy making. Remove from heat. Add the remaining ingredients and stir until well-blended, but don’t overdo it. Do not scrape the sides or the fudge will be gritty. Pour into the prepared 9x13 pans. Allow to set in the refrigerator overnight. Cut into 1-inch squares and store in a the refrigerator in a tightly sealed container. i just wanted to thank you for your recipe posts. I’ve decided to dedicate some time into making quality meals for myself, as i get lazy when cooking only for myself. you’ve given me some inspiration! Thank you! I’m certainly no professional chef, as my recent post about my Top Ten Culinary Flops will prove. I just enjoy cooking, sharing what I’ve learned, and learning from other cooks.